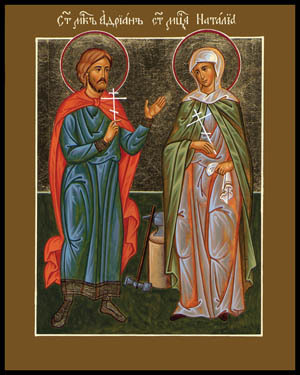 Thy Holy Martyrs, Adrian and Natalia, O Lord, through their sufferings have received their incorruptible crowns from Thee, our God. For having Thy strength, they laid low their adversaries, and shattered the powerless boldness of demons. Through their intercessions, save our souls. 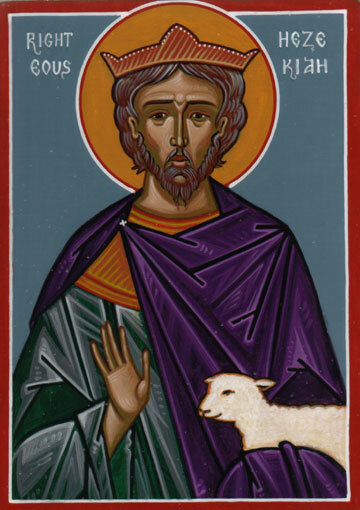 Martyr of Christ, Adrian, thou didst keep the words of thy godly and devoted wife Natalia in thine heart. With her thou didst accept every kind of suffering, and didst obtain the crown of victory! ➢ The parish is looking to purchase new vestments for altar servers. Please give designated donation if you would like to contribute. So far we have received $265, and we will need roughly $600 for four sets. The “Box R Ranch” retreat begins this afternoon. Please come and participate as much as you would like! Speak to Hala if you need directions, or if have any questions. If you are able to help out with watering and simple gardening/cleaning once a week at the Newman Center, please contact John or Macrina. On August 28 the Church remembers the righteous Hezekiah, king of Judah and son of the previous king, Ahaz. Perhaps Hezekiah, who became king at the age of 25, felt compelled to make up for the actions of his notorious father, who would never listen to the prophet Isaiah and who shut down the Temple in Jerusalem, instead revering the gods of the Assyrians. Hezekiah labored intensely to reinstate worship of Israel’s God. At the beginning of his reign he ordered the Temple to be reopened, directing the priests and Levites to “carry out the filth from the holy place” (2 Chronicles 29: 5). They did so, and were able to report to the king that “All the utensils which King Ahaz discarded in his reign when he was faithless, we have made ready and sanctified; and behold, they are before the altar of the Lord” (29: 19). Hezekiah and the people brought sacrifices and thank offerings, and “thus the service of the house of the Lord was restored” (29:36). To celebrate, Hezekiah sent couriers all over the kingdom with a decree that the priests and people should come to Jerusalem and observe Passover together. Scripture candidly records that in some places the couriers were laughed to scorn and mocked, and that “only a few of the men of Asher, of Manasseh, and of Zebulon humbled themselves and came to Jerusalem” (30:11). Nevertheless, a great assembly did come for the feast, including some people who had not properly prepared themselves, and who “ate the Passover otherwise than as prescribed” (30: 18). Hezekiah, obviously a forgiving and loving man, had prayed that God would “pardon every one who sets his heart to seek God, the Lord the God of his fathers, even though not according to the sanctuary’s rules of cleanness” (30: 19). Hezekiah’s efforts strengthened and helped unite the people, but they still faced external threats. When Sennacherib, the powerful king of Assyria, attacked Judah, Hezekiah’s first response was not a noble one. Panicked, he offered Sennacherib huge sums of money to withdraw. In order to pay, he gathered all the silver in the Lord’s house, and even “stripped the gold from the doors of the temple of the Lord” (2 Kings/4 Kingdoms 18: 16). But the Assyrian couldn’t be bought off, so Hezekiah did something better—he built up and reinforced his people’s walls and defenses. He also returned to reliance on God rather than money, and told everyone not to be “afraid or dismayed before the king of Assyria and all the horde that is with him; for there is one greater with us than with him” (2 Chronicles 32:7). He and Isaiah prayed, and God answered their prayers by destroying the Assyrian warriors. Close to death, Hezekiah had to repent of an episode of pride before God. He was not a perfect person, but Scripture compares him to King David, another man who greatly pleased God in spite of many missteps, weaknesses, and faults.